Up to 500 Free Spins on Starburst Visit website for full T&C's. All Star Games was chosen as one of the best UK bingo sites! Jumpman Gaming sites are arguably some of the hottest on the internet at the moment. 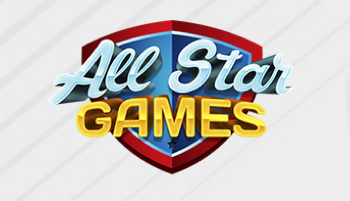 All Star Games is a wonderful site on the Jumpman Slots network that will be sure to have you feeling like a winner. Check out our full All Star Games review to find out why this site stands out. When you sign up to All Star Games, unfortunately you won’t find any no deposit free spins but you can help yourself to some freebies. On your first deposit just pop £10 or more into your account for a spin of the Mega Reel. Spin and you could win the likes of 500 free spins on the top Starburst slot game. VIP Scheme – Work your way through the levels here to earn bigger bonuses and more free spins every month. Anything you wager here will add to your VIP balance. Share your Win – If you win big on this site, make sure you take a screenshot of your winning moment. Then, share it to Facebook to win 20 free spins. Happy Hour – Log into your account on a Wednesday for a gift of 10 free spins. You have to be a funded roomie to get them but it’s well worth the deposit. Win Pizza Each Sunday – If you fancy winning a free takeaway then play slots each weekend here. On Monday you might just open up your inbox to find a pizza voucher. These are some of our favourite regular bonuses and promos on the site, but you can look out for more each time you log in. Be sure to read the terms and conditions for all of the essential information that you need on site. The selection of games here is super, you won’t get bored with what they’re offering. All of the games are high quality creations from the likes of Eyecon and NetEnt. These are ideal for even the newest players, as they’re all straightforward and easy to play. If you like to have a few spins on slots then you’ll find hundreds to take your fancy. They have a whole load of casino games too, with table, card and skill based games. You can organise the lobby into popular or new games, depending on what you’re looking for. Not all of these can be used for withdrawals but there’s a decent selection for both deposits and withdrawals. There are many Jumpman Gaming sites out there but All Star Games is an outstanding example of what this provider can go. They have loads of special bonuses, games and distractions for you to take a look into. Remember to claim that top welcome offer when you head there!